A YOUNG GIRL OF THE CANTON SCHWYZ. THE costume of women and young girls in the Canton of Schwyz, and especially in the chief place of that name, is characterized by a certain degree of stiffness, and approaches the ancient French taste; it is something between the dress of the peasant and the citizen. It follows, too, the caprices of fashion, and is subject to various changes. 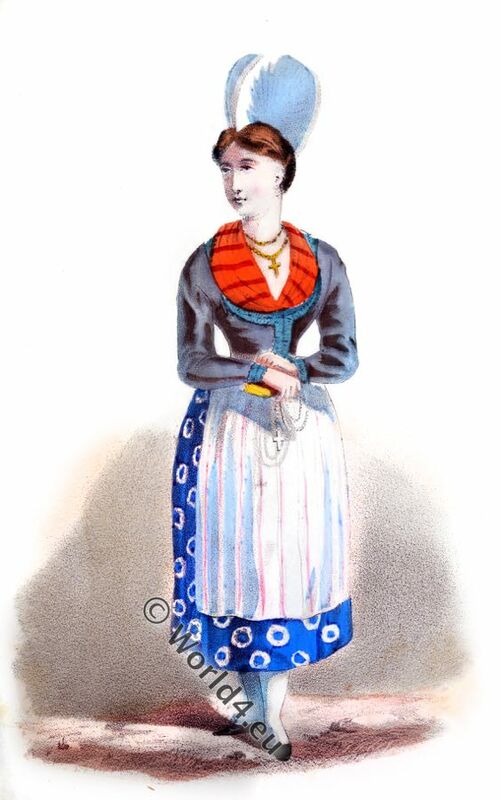 The ordinary and more or less modern dress of the inhabitants consists at the present time of a black woolen corset, bordered with silken trimmings; a skirt, in part wool, ornamented with blue stripes or flowers, covered with a linen apron of various colors; white cotton stockings; shoes ornamented with little silver buckles. The hair is gathered into a twist at the back of the head; the principal ornament consists of an original and unique coif, composed of common and coarse laces, rising in two enormous butterfly wings, between which rests a tissue of artificial flowers, intermingled with tinsel, and fastened by a large silver eagle set transversely in the hair. This headdress, singular as it is, does not fail to be pleasing when it decks the head of some pretty blonde. It is naturally less becoming to ladies of a certain age, when the hair is gray and powdered. Finally, as a mark of feminine piety, girls and young women rarely go forth without holding in the hand a rosary and a book of prayers. Source: Select historical costumes compiled from the most reliable sources by Henry Hinton. Published: 1868. Publisher: New York Wynkoop & Sherwood. This entry was posted in 1868, 19th Century, Switzerland, Traditional and tagged Canton of Schwyz, Traditional Switzerland costumes on 4/13/17 by world4.